It boasts some architectural accolades, as well: When first opened, the building was the largest unsupported steel-dome coliseum in the nation. Now, Bojangles’ Coliseum is getting something else it roundly deserves: a makeover, including new video scoreboards from Daktronics and a new VUE Audiotechnik PA system that replaces Altec-Lansing horns that date back to the Elvis Presley era. 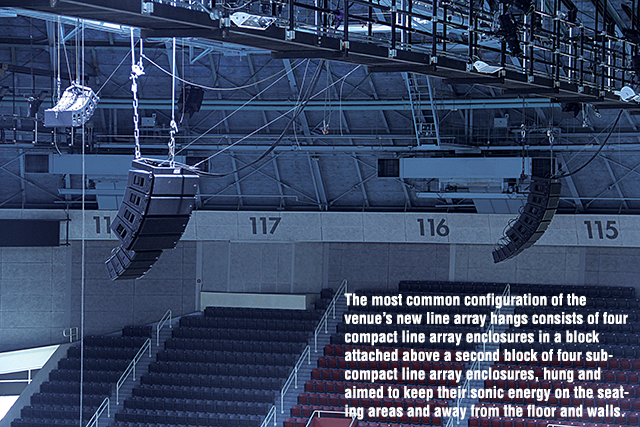 The $16 million renovation, timed for the November 7 faceoff for the AHL Charlotte Checkers hockey team, is also the largest sports-venue installation to date for VUE Audiotechnik (established in 2012, the company is part of a growing group of loudspeaker manufacturers looking for market share in the booming live-event and sports-arena venue market), and the first sports-arena project for Inter Technologies, the Raleigh NC-based AV systems integrator that installed the audio system and has, since its founding in 2000, been focused on the education, government, corporate and theatrical verticals. “It’s quite a leap, going from 1955 to 2015,” said Chris White, Western Regional Sales Manager for Inter Technologies, still marveling at how the vintage Altec horns had remained in place so long. The new system, originally designed by Charlotte-based AE Global Media, will, indeed, pull Bojangles’ Coliseum through a time warp. Line array sound systems were essentially theoretical when acoustical pioneer Harry Olson first published his findings on the topic in a 1957 technical paper. Today, the design tends to be the go-to approach from the beginning for anything from a major sports arena to the stage at the local VFW hall. In this case, the system design called for a dozen line array hangs: eight consisting of four VUE al-8 compact line array enclosures in a block attached above a second block of four VUE al-4 subcompact line array enclosures, hung and aimed to keep their sonic energy on the seating areas and away from the floor and walls. Two additional blocks, consisting of six al-8s and four al-4s, are used to cover center-ice seating areas, while two more hangs of six al-8s each are used to cover the floor, when necessary, such as for trade events or conventions. 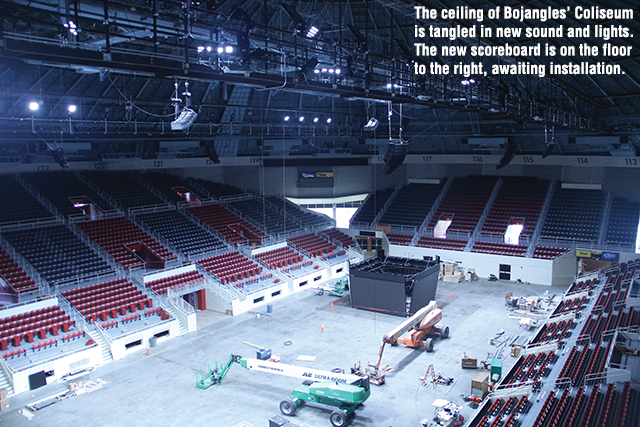 Bojangles’ Coliseum is also getting the benefit of another technology that hadn’t been invented when its first sound system went in: digital audio networking. This was an element of the system design that Inter Technologies changed after the original design had been finalized. 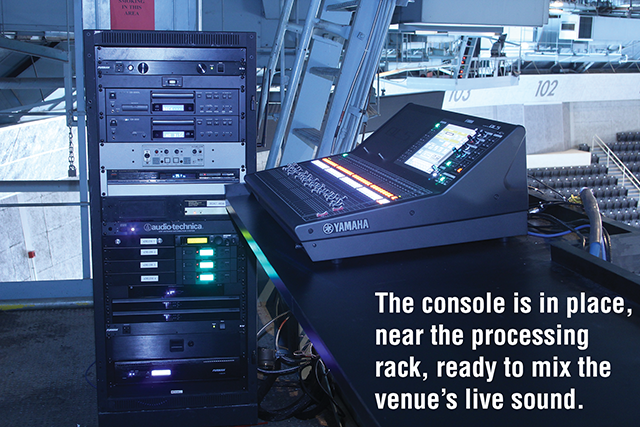 Initially, that plan had called for using the analog output of the new Yamaha QL-5 console to be converted to digital before the input stage of the BSS BLU-100 12×8 signal processor, which would handle the system’s delay and equalization processing, then convert it back to analog for distribution to the V6 and V4 amplifier/processors. The A-D-A conversion processes would have introduced latency and qualitative degradation into the signal chain. Instead, offered White, the decision was made onsite to switch the processor to a BLU-160, which has digital I/O and, using the AES3 digital outputs of the QL-5, send a digital signal all the way through to the amplifiers. The Dante networking compatibility of both the Yamaha console and VUE Audiotechnik’s DSP devices (the speaker manufacturer announced the integration of the Dante Ultimo chip in its V-series products at this year’s InfoComm Show) allows the system to extend inputs to other areas of the arena, via Pakedge network switches and Yamaha RIO 1608 stage boxes. “That provides additional microphone inputs that will be useful for the stage shows and graduation ceremonies that the arena is used for,” said White. Bojangles’ Coliseum also has a new video scoreboard. Daktronics systems comprise a center-hung display configuration consisting of four main video displays, four auxiliary displays and a ring display. The main video displays measure about 12.5 feet high by 22 feet wide and feature 10mm line spacing. The ring display included in the center-hung configuration measures about two feet high by 62 feet in diameter, and the four auxiliary displays, fitted above the main displays, are two feet high and 22 feet wide. 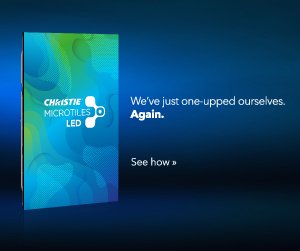 These displays feature 20mm line spacing. The installation also includes four ribbon displays, one in each corner of the arena, measuring about four feet high by 59 feet wide. These displays feature 20mm line spacing and provide supplemental content to the main displays, as well as highlighting sponsors throughout events. 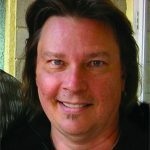 In an era when venue construction has mushroomed, propelled by the growth of sports franchises and live-music industry giants Live Nation and AEG Live, conglomerates whose real-estate interests rival their concert productions, Bojangles’ Coliseum now offers both a sense of history and a state-of-the-art venue in terms of AV. With the new seating that was also part of the renovation, its competitiveness has been significantly enhanced in a challenging market.